I will always have the highest regard for director Jon Amiel, but The Core is not the reason for that. * This is a movie that plays like a cross between Michael Bay’s Armageddon set underground and cheesy 1950’s sci-fi flicks — comparisons I’m certainly not the first one to make. Watching it, I actually had to remind myself that The Core was released as late as 2003 and is only six years old. The plot and so-so visual effects make parts of it feel quite dated already. The story opens with a series of unsettling events around the world (or at least in the U.S. and the U.K.): people with pacemakers suddenly drop dead, pigeons lose their navigational abilities and crash into buildings, and the space shuttle Endeavour makes an emergency landing in central Los Angeles due to electromagnetical disturbances. Military figures immediately round up a number of experts on geology and electromagnetism in order to analyse the incidents (“People die mysteriously — we need a geologist!”). We thus meet scruffy university professor Dr Josh Keyes (Aaron Eckhart) and his diametrical opposite, the snobbish Dr Conrad Zimsky (Stanley Tucci). Their combined work soon lead them to conclude that the Earth’s core has stopped rotating. Doctors Keyes and Zimsky demonstrate the consequences of this by blowtorching a peach: the Earth’s electromagnetic field will vanish within a year, causing the Sun’s radiation to devastate the planet and kill everyone. The Armageddon vibes get stronger as a band of colourful characters are assembled to solve the crisis. Aside from the professors, there’s also a rogue scientist (Delroy Lindo) building a “ship” capable of travelling through the Earth’s core, a couple of highly skilled astronauts (Bruce Greenwood and Hilary Swank), and a computer hacker called Rat (DJ Qualls). The underground ship, named Virgil, is dropped in a deep sea trench and starts blasting its way down through the planet’s insides towards the molten core, where the plan is to kickstart the sucker through the cunning use of nuclear bombs. Because as we disaster movie fans know by now, there is no crisis that can’t be solved by exploding some nukes. As you might be able to tell, this is a science fiction movie where science is not the most essential ingredient. I am usually very forgiving towards disaster films in this respect, but The Core strains credibility more than most. The film is well-paced and offers a fair number of action sequences, while the actual disaster scenes are few and rather quickly skipped over. 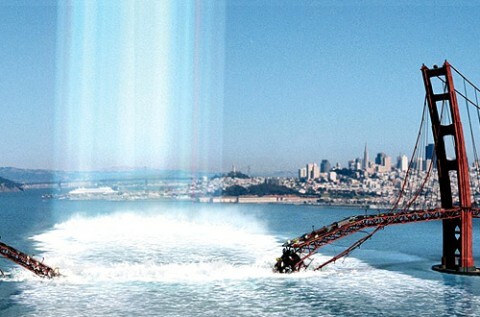 We do get to see a “super storm” blasting Rome and some kind of cosmic ray destroying the Golden Gate bridge and frying unfortunate motorists in their cars, but mainly, this one feels more like a straightforward sci-fi action flick than a disaster film — another thing it has in common with Armageddon. It does, however, feature a very nice cast, though all have given more impressive performances elsewhere. And it does kill off a good number of the main characters along the way — always a redeeming feature in any film. Well, almost any film. Watchable, if you have nothing better to do. * The reason I still regard Amiel very highly is of course his work on the 1986 miniseries The Singing Detective, which in my humble opinion is one of the very finest pieces of television ever produced. Check it out. Tchéky Karyo, DJ Qualls, Bruce Greenwood. sci-fi flicks — comparisons I’m certainly not the first one to make. effects make parts of it feel quite dated already. landing in central Los Angeles due to electromagnetical disturbances. diametrical opposite, the snobbish Dr Conrad Zimsky (Stanley Tucci). planet and, of course, Kill Everyone! now, there is no crisis that can’t be solved by exploding some nukes. another thing it has in common with Armageddon. film. Well, almost any film. one of the very finest pieces of television ever produced. Check it out.